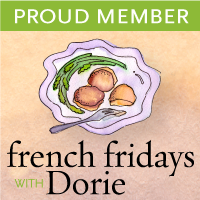 Friends often tell me how they're scared of making biscotti, mostly because of the two-bake process. But it's one of the easiest and low maintenance cookies. Just some cutting and a bit of flipping; otherwise, you let the oven do most of the legwork. What you do need is to set aside a bit of time, as biscotti are dependent on low heat to draw out the moisture from the cookies without burning them to charcoal. 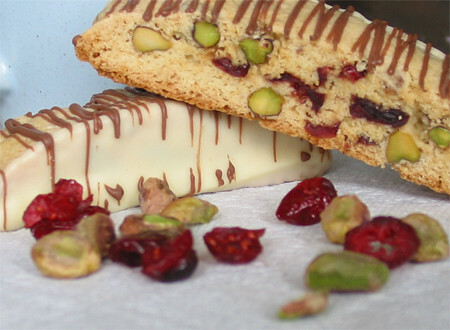 This is one of my favourite biscotti flavour—the buttery pistachios, the sweet-tart cranberries, and the fruity olive oil. To make them more festive and fancy, I often like to dip them in white chocolate, or drizzle white and milk (or dark) chocolate over them. 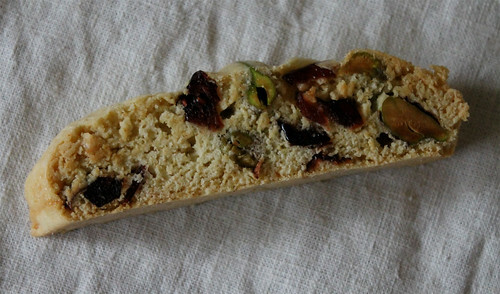 You can find the recipe for Cranberry Pistachio Biscotti here.